Aboriginal Tourism Sharing our Culture Calender - 2015. 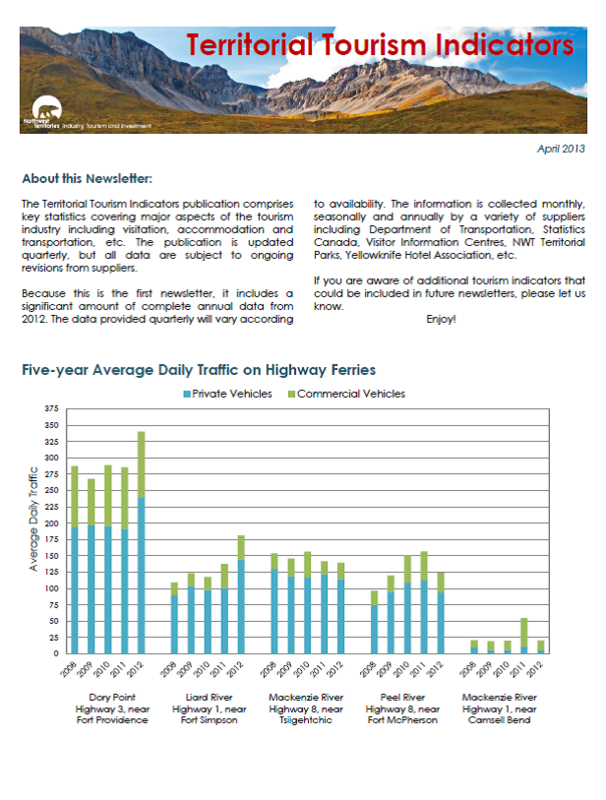 Newsletter regarding tourism indicators in the NWT including key statistics and relevant global trends. The 4th edition of the Sahtu ITI Newsletter. A fact sheet covering the basics of the Gahcho Kue diamond project. Fact sheet regarding Socio-Economic Agreements. Addresses some of the key trends that impact tourism in the NWT and includes preliminary results from the 2010/2011 Leisure Visitor Exit Survey. A Minister's newsletter providing updates on ITI's involvement in the Protected Areas Strategy, including it's sponsorship of areas in the Dehcho region. A seasonal newsletter on the trapping community in the NWT.